After working in many of LA’s best restaurants -- including running the pastry program at Orsa & Winston -- Isa Fabro has carved out her own notable path this year to become the name you need to know if you have a sweet tooth in LA. 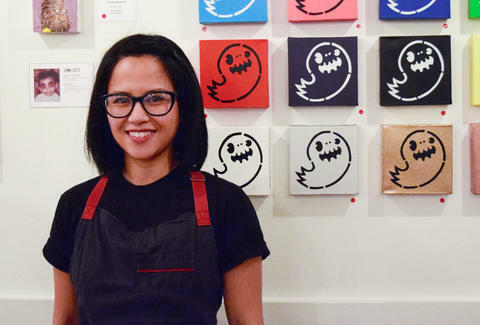 At Unit 120, Chef Alvin Cailan’s restaurant incubator in Chinatown, she’s spent the year slinging deliciously creative, often Filipino-inspired desserts, as well as plenty of savory options. There were the isamadas, her namesake mashup of flaky French kouign amann and ensaymadas, a Filipino brioche, which she fills with ube and tops with sweet cheese -- and, of course, there was her the wildly successful Detroit-style pizza pop-up this fall. Recently she’s been working tirelessly to turn out her holiday pies, which include Filipino riffs like Food for the Gods, which features a brown butter filling with dates and walnuts, and caramelized coconut on top. We talked with her about the emergence of Filipino food into LA culture, her proudest moments of the year, and working out of a tiny popup window. What has the past year been like for you? Isa Fabro: This has been a completely unexpected year for me. It really started out as a very casual pop-up idea. I wasn't working and wanted to keep busy. Then I think with the timing of how Unit 120 opened and me just doing my own thing, a lot of opportunities came out of that. Suddenly I was doing a donut popup, and then the opportunity of doing food at Coachella happened, and then from there it was about getting excited about different kinds of desserts. And suddenly people who were now drawn to Filipino food were trying to find more kinds of food that were like that. I didn't set out saying, 'I'm going to do Filipino food' -- it was a gradual thing for me. I took a trip [to the Philippines] in February for almost the entire month and I started cooking Filipino food for the first time. I went all over and I got a great overview of many different kinds of food. So when I came back, I said, 'I want to keep busy and try making some of these desserts.' And people were really responding to them and I was enjoying myself, too. I've never cooked Filipino food in a professional sense, it was always, 'OK, I'm a chef at this restaurant and this is the style -- whether it was New American, Italian, or fine dining -- and I'm creating a menu for that restaurant.' So this was the first time I was like, I’m going to make Filipino-style desserts, but with my background, I wanted to put a spin on it. How have you seen the perception of Filipino food evolve over the year? Fabro: When I started doing this food in March, people were like, 'Oh, what is that?' And now, people know what Filipino food is. Or they'll say, 'I know what ube is, or I know what that tastes like or that I like that already.' So there's been an evolution I've seen, not just for me, but [Unit 120] has been a nexus for Filipino food, and I feel like it's a joint effort where people have been drawn to the energy here. You're in an environment with a bunch of chefs who are working hard, and are also highly creative. And working with Chef Alvin Cailan, it's always been a standpoint of doing something fun or just an idea where we say, 'Can we make this happen?' And, it's like, 'yeah, we can make this happen.' It’s great having a platform where people are excited about it. There’s also the element of surprise, where people say, ‘Oh, I thought she was just a pastry chef.’ And it's like, no, most people who work in kitchens, they have a well-rounded education of how to make all different kinds of food. What are some of your proudest accomplishments from this year and what’s next? Fabro: This has been a huge year, but there's been a long lead up to this year. After this year, it's going to be 14 years of me working in a kitchen. I had to decide to first start working for myself, but I would never have done that if [Unit 120] didn't exist because they're wouldn't have been that opportunity. People are being very receptive to what I'm doing, and I'm just excited, too. Everything that I've ever made out of here I've tested or had an idea where I say 'this tastes good,' and I'll say, 'Oh, I want people to eat this!' So it’s been that kind of infectious enthusiasm. Part of what I've been doing here has been dictated partly by what I've been able to handle work-wise. Every project that I've done, it's been by myself because I don't have a staff. And because of that, I have the freedom to be able to change things up, like when we did pizza. And it’s been great getting into that groove of testing a concept and having that be validated, not just by customers, but by food critics. One of the best thing about this year has also been the ability to bring my food to a wider audience. I've mainly worked in fine dining, which means most of my menus have been at a higher price point that not everyone has been able to afford. Working out of Unit 120 means I can bring guests the same quality and technique I've applied in my past kitchens at a price point that everyone can afford. If you want to advance culture through food, you need to include everyone, and not just a select few. In short, well-crafted, delicious food should be available and experienced by everyone; people shouldn't be excluded simply because of their economic means. People ask, ‘Are you going to have your own place?’ And, you know, I'm not really thinking about that just yet. Right now, I'm flexing to see, can I make a really great pizza, can I design a great bread program, or dessert program. I have those kind of opportunities, whereas if you're working in a restaurant -- that doesn't happen. You have to train a staff, you have to come up with a seasonal menu and it's very much about operations. But this was me learning how to take my kitchen work experience and applying it to opportunities that were being thrown at me. If anything the best thing about this year that I've been most happy about is just being able to run with my creativity and my gut. As far as making decisions, I haven't had to wait for somebody to tell me what to do or wait on other people. You can find Danny Jensen at @dannyseamus on Instagram and Twitter.